Many Nokia N8 users searched on line for the way to transfer or copy or sync their movies and music from PC or Mac to Nokia N8, but can not find useful information, now in order to help these Nokia N8 users to put and transfer /sync their videos or music to Nokia N8 on Windows and Mac successfully, just write this short guide to show you the way. Step 1: Download Nokia Ovi Suite (only for windows), which is an application for Nokia users to connect their devices with PC; it allows you to easily sync videos and music with Nokia N8. Step2: Prepare your movies and music. Connect Nokia N8 to computer with USB cable or Bluetooth. Once mounted, on the computer, open the drive that represents your device. It should be in My Computer for Windows users. Step3: To copy music or videos between your phone and your computer, you can either drag and drop or right click on the file you want to transfer. * Drag and drop: In Nokia Ovi Suite, select the movies or songs you want to copy and drag them to a folder on Nokia N8. * Right click: Right click on the video or music you want to copy to Nokia N8 and select Copy to phone. Step4: After copying movies or music, eject the drive - Nokia N8. Step 1: Connect your Nokia N8 or other Nokia devices to your Mac using Bluetooth or a USB cable. Then use an excellent app - iSync for sync and copy movie/music from Mac to Nokia N8. Step2: Start iSync from the Applications folder on your Mac, then select Add device from the iSync menu. And then choose your Nokia device – Nokia N8 from the list – it will then appear in the iSync window. Step3: Prepare your movies and music you want to synchronise. Then sync the movie/music from Mac folder to Nokia N8 with ease. After syncing movies or music, eject the drive - Nokia N8. Note: There are two situations you can not play the videos on Nokia N8 successfully. 1. You movie formats are not supported by your Nokia N8, maybe they are MKV, AVI, M2TS, TiVo, FLV, DivX, MXF, MOV, etc, so you need to convert the movies into Nokia N8 compatible format MP4. Aunsoft Nokia N8 Video Converter can help you. And this article can tell you how to convert/play video to Nokia N8. 2. Your source video is over 640 x 360, this resolution can not play back on Nokia N8. So you must be sure to set the width and height to a maximum of 640 x 360. 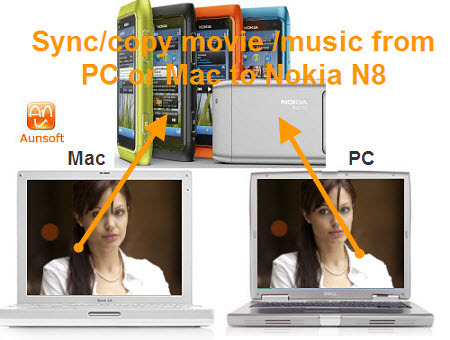 Now have you already know how to copy/sync/transfer movies and music to Nokia N8? Hope you have a pleasure movie enjoyment.